THE Minister of Education, Pehin Orang Kaya Indera Pahlawan Dato Seri Setia Awang Haji Suyoi bin Haji Osman has urged athletes to always prepare for a match, while also taking care of Brunei Darussalam’s culture and skills as well as respecting each other during a championship. He said this during a meeting with Brunei Darussalam Sports Schools Council (MSSBD) contingent who depart for Singapore today to participate in the 9th Asean Schools Championship from July 14-20. The MSSBD contingent is led by Haji Azis bin Haji Nayan, Acting Director of Co-Curriculum Education as Chef de Mission. Twenty-six people depart for Singapore today comprising eight officers and 18 athletes. They will compete in three sports events namely table tennis, sepak takraw and ten-pin bowling. Of the 18 athletes, table tennis will be played by two athletes who will compete in Single and Double categories; while four ten-pin bowling athletes will compete in Single categories, Doubles and Teams; and sepak takraw will be represented by 12 athletes who will compete in the Teams category, Inter-Regu and Doubles. The minister wished for coaches to always motivate and support national athletes to improve their performance and determination in the competition. The minister also hoped the athletes will return with success, and most importantly, gain knowledge and experience from the tournament. Also present at the meeting were Dr Hajah Romaizah binti Haji Mohd Salleh, Permanent Secretary at the Ministry of Education (MoE); Nadia Lee Siew Hoon binti Abdullah, Deputy Permanent Secretary (Core Education) at the MoE. BRUNEI Darussalam Sports School Council will be sending a contingent to participate in the 9th Asean School Games 2017 in Singapore from July 13-21. The contingent will be represented by 18 athletes and eight officers. Brunei will participate in three sports event which are tenpin bowling, sepak-takraw and table tennis. Following this, a handing over of the national flag was held yesterday at the Sports School in Kampong Pulaie. 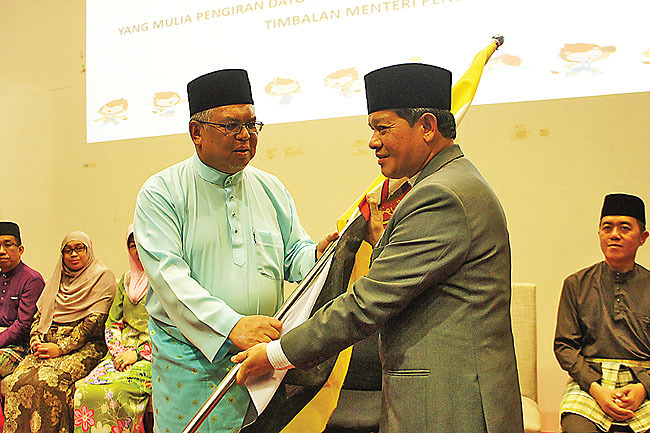 The flag was handed over by Pengiran Dato Paduka Haji Bahrom bin Pengiran Haji Bahar, Deputy Minister of Education to the country’s Chef de Mission, Haji Azis bin Haji Nayan, Acting Director of the Co-Curriculum Education Department. It was then followed by a mass Sunnat Hajat prayer to seek protection from Allah the Almighty. The Asean School Games is an annual sports competition carried out since 2009 among Asean students. The games aim to enhance sporting spirits among the students, while also driving social development through sports cooperation network, encourage active communication and cooperation in sports. One gold, one silver and three bronze medals were added into the country’s medal haul in 2015, when Brunei was the host. Brunei will receive an official appointment as the President of Asean Schools Sports Council (ASSC) during the 54th ASSC Management Committee (MC) Meeting on July 14 for a period of two years replacing Vietnam. A 26-MEMBER contingent of the Brunei Darussalam Sports School Council (MSSSBD) left for Singapore yesterday to participate in the 9th Asean School Games. The tournament will last for nine days from July 13-21, 2017. The MSSSBD contingent is led by Haji Azis bin Haji Nayan, the Acting Director of the Co-Curriculum Education Department who is also the Chef de Mission. 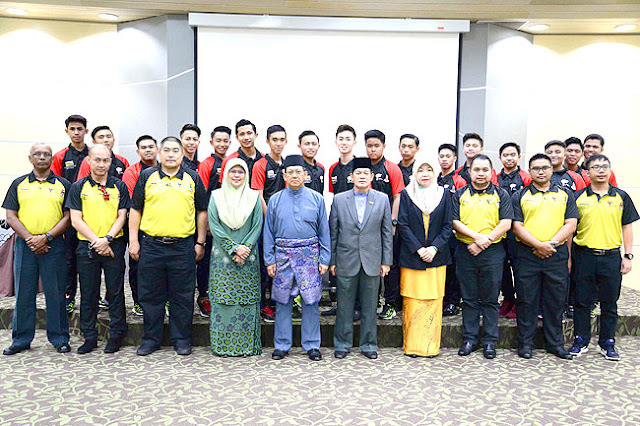 He told the Bulletin that the Brunei contingent consists of eight officers and 18 athletes and will take part in three sports events namely table tennis, sepak takraw and tenpin bowling. The athletes comprise a selected group of students from various secondary schools participating in tournaments organised by the Co-Curriculum Education Department. Brunei Darussalam will also receive the appointment as President of Asean Schools Sports Council (ASSC) during the 54th ASSC Management Committee (MC) Meeting on July 14, 2017 for a period of two years from January 1, 2018 to December 31, 2019 to replace Vietnam, the President of ASSC for 2016-2017. Present as the representative of Deputy Minister of Education to receive the appointment will be Dr Hajah Romaizah binti Haji Mohd Salleh, Permanent Secretary (Core Education) at the Ministry of Education who also left yesterday for Singapore. The best achievement of the MSSSBD in the tournament was one gold medal, one silver medal and three bronze medals when Brunei Darussalam hosted the competition back in 2015. The tournament is organised every year since 2009 and Asean member countries take turns to host the championship. This year will see first time participation from Myanmar, making it all 10 Asean countries at the tournament. Among the objectives of the Asean School Games is to help foster a greater collaboration among students from Asean member countries, spur social progress through cooperation in sports, encourage more active cooperation and communication in sports and contributing towards peace and stability in Asean region, to produce future elite athletes in the Asean region and to support the policy of Asean member states towards a healthy life style through sports activities. Mohd Faizuri bin Safar from Tutong Sixth Form Centre said he will represent the nation in tenpin bowling and training has been conducted for the past several months including fitness. “We hope to get podium finish for the country. Four participants will compete in single, double and team events. We got silver medal in the tournament held in the Philippines. Previously, I competed in Kuala Lumpur, Hong Kong, the Philippines and many more,” he added. Another athlete, Mohd Nazirul Azmi bin Masdi from Pehin Dato Seri Maharaja Secondary School in Mentiri will take part in the sepak takraw event and hopes to get a medal. “This is the first time that I compete in this international meet,” he said. THE final matches of the National Table Tennis Championship organised by the Brunei Darussalam Table Tennis Association (BDTTA) took place yesterday at the Multipurpose Hall of the Menglait Sports Complex in Gadong. 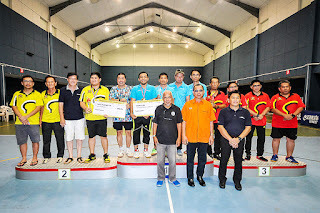 Md Hanifah bin Haji Bungsu emerged champion of the Singles Category after he edged Pengiran Mohd Sufian bin Pengiran Haji Ibrahim with the score of 4-3 (13-11, 8-11, 6-11, 5-11, 11-9, 11-7, 5-11). Wee Tzu Min and Zulfadli took joint third place. In the Doubles Category, Samuel Revales and Zulfadli won after beating Paul Lim and Md Arib Zalidi 4-1 (11-7, 11-8, 6-11, 11-4, 11-7). Pairs Wee Tzu Min and Douglas Lim, and Awangku Sufi and Awangku Rasheed took joint third place. Haji Mohaimin bin Haji Johari @ Jahari, Village Head of Kampong Wasan, Brunei-Muara District presented the prizes in his capacity as the guest of honour. The Brunei Darussalam Table Tennis Association also presented prizes for the recent Dato Sri Goh Sin Han JP Borneo Table Tennis Championship in Labuan. BANDAR SERI BEGAWAN, 14 Mei – Beberapa perlawanan akhir ping pong berlangsung hari ini anjuran Persatuan Ping Pong Brunei Darussalam yang berlangsung di Kompleks Sukan Menglait,Gadong. Dalam perlawanan akhir tersebut, Mohd Hanifah Haji Bungsu tampil juara dalam Kategori Perseorangan apabila mengalahkan Pengiran Mohd Sufian bin Pengiran Haji Ibrahim dengan mata 4-3 dan tampil di tempat ketiga bersama ialah Wee Tzu Min dan Zulfadli. Dalam acara regu pula pasangan Samuel Revales dan Zulfadli tampi juara apabila menumpaskan pasangan Paul Lim dan Mohd Arib dengan mata 4-1 meninggalkan pasangan WeebTzu Min dan Douglas Lim serta pasangan Awangku Sufi dan Awangku Rasheed yang akur ditempat ketiga bersama. Hadir selaku tetamu kehormat majlis dan seterusnya menyampaikan hadiah kepada barisan pemenang ialah Ketua Kampung Wasan, Haji Mohaimin bin Haji Johari @ Jahari. Penyampaian hadiah di akhir majlis turut menyaksikan barisan pemain yang berjaya meraih kemenangan di dalam kejohanan Ping Pong Dato Sri Goh Sin Han JP di Labuan baru-baru ini. Barisan pemenang di akhir majlis itu. THE Brunei Darussalam National Tennis Association will be hosting a couple of tournaments aimed at unearthing talented players. The Brunei National Table Tennis Championship will be held on May 5-12 while the Brunei Junior Table Tennis Championship on May 7-14. Both tournaments will be held at Menglait Sports Complex. The former is divided into five categories, namely men’s singles, women’s singles, men’s doubles, women’s doubles and mixed doubles. The entry fees for singles are $5 (member) and $10 (non-member). For the doubles, the fees are $8 (members) and $16 (non-member). The closing date for registration is May 1. The Brunei Junior Table Tennis Championship is divided into 10 categories – boys’ singles (Under-18, Under-15 and Under-12), girls singles (Under-18, Under-15), Under-18 boys’ doubles, Under-18 girls doubles, mixed doubles (Under-18 and Under-15 and Under-12 girls’ doubles. The closing date is May 1. Entry forms for both events can be collected from Anthony Liew, secretary of the association. BANDAR SERI BEGAWAN, 27 April – Tiga pasukan daripada Persatuan Ping Pong Brunei Darussalam (BDTTA) iaitu Pasukan BDTTA Romeo, BDTTA Sierra dan BDTTA Tango akan menyertai Kejohanan Ping Pong Jemputan Borneo Piala Dato Sri Goh Sin Han 2017 di Wilayah Persekutuan Labuan bermula 29 hingga 30 April. Enam belas buah pasukan akan menyertai kejohanan itu termasuk tiga dari Brunei Darussalam dan pasukan-pasukan akan dibahagikan kepada empat kumpulan. Kumpulan A terdiri daripada Pasukan Mustang, BDTTA Tango, KKTTA ‘B’ dan TUDM A.
Sementara dalam Kumpulan B pula menyaksikan Pasukan Labuan Fortune Hotel, JPK Sabah, BDTTA Romeo and G7T. Manakala dalam Kumpulan C ditempatkan Pasukan KKTTA ‘A’, IPD Labuan, TUDM B dan Poseidon. Dan dalam Kumpulan D terdiri daripada Pasukan BDTTA Sierra, Tuaran TTA, Papar Romo United dan TUDM C.
Mengetuai rombongan negara ke kejohanan itu ialah ketua jurulatih, Pengiran Sufian. Manakala setiap pasukan mempunyai ketua masing-masing, Pasukan BDTTA Romeo akan diketuai oleh Mohd Hanifah Haji Bungsu dan akan disertai oleh Haji Rusli bin Haji Yusop, Wee Tzu Min, Puh Suan Kan, Mohammad Arib Zalidi bin Abdul Latif, Chen Hian Chin dan Jiffy Bataan Fonbuena. Sementara Pasukan BDTTA Sierra will akan diterajui Samuel Revales dan akan disertai oleh Lim Kian Hioing, Zulfadli bin Abdul Rahman, Lai Kok Siung, Hu King Ung, Low Day Yei dan Tan To Ming. Omar bin Nasir pula dilantik selaku ketua Pasukan BDTTA Tango dan akan disertai oleh Mohd Rapaie Bagol, Rahim Munggu, Muhammad Mujjiib bin Abdul Musauwir, Abdul Kifli bin Haji Abdul Alim, Pengiran Muhamad Wa’ie Sufiyan bin Pengiran Haji Mohd Saifin dan John Joseph Roy. Pasukan BDTTA yang akan mewakili negara ke Kejohanan Ping Pong Jemputan Borneo Piala Dato Sri Goh Sin Han 2017. THE new executive committee for the Brunei Darussalam Table Tennis Association (BDTTA) has been announced with Haji Daud bin Haji Hitam installed as the president for 2017-2018. The appointment took effect as of Sunday with Anthony V C Liew appointed as the Secretary General, Haji Said bin Haji Sh Yahya as Vice-President I and Haji Rusli bin Haji Yusop as Vice President II. Other senior positions also included Md Mujib bin Abdul Musauwir as treasurer and Wee Tzu Min taking the role of assistant secretary. The committee members included Omar bin Nasir, Pengiran Haji Mohd Noor bin Pengiran Haji Tajuddin, Samuel Revales, Sheikh Haji Abd bin Kadir Sh Haji Yahya, Pengiran Mohd Sufian bin Pengiran Haji Ibrahim, Haji Damit bin Haji Abdul Rahman and Md Eizza bin Haji Suhaile. The position of internal auditor has been occupied by Sia Leong Ping to complete the new executive committee for the new term. THE Brunei Darussalam Table Tennis Association (BDTTA) bagged a silver medal at the Malaysia International Masters 2015 in Sabah last Sunday. The Sultanate’s team of BDTTA Romeo concluded the two-day tournament by claiming second place in the Team Event Novice category after they lost 3-2 to the Sandakan Ping Pong Association at the Borneo Sports Arena in Kolombong, Kota Kinabalu. Two other teams sent by BDTTA, Siera and Tengo, went to the Consolation Pool after they lost in the Novice category in their respective group. BDTTA’s Siera claimed the Consolation Pool category title after a comfortable 3-0 win over Kota Marudu Silent Killer from Sabah. Speaking to The Brunei Times, BDTTA vice president Hj Said Sheikh Hj Yahya – who is also the team manager and one of the players – was pleased with the team’s achievement. “I am very happy with the results as we have shown great spirit the whole tournament,” he said. “Despite battling against players with more experience and international training, we still managed to provide a great challenge. “As for the consolation category, all players are rather balanced. It was just a matter of sorting out which players played which sets, and that led to our victory,” he continued. In the Team Event Novice category, BDTTA’s Mohd Zul lost to Nelson Liam despite taking the lead two times in a match that ended 3-2 (11-9, 3-11, 14-12, 10-12, 6-11). Brunei then endured their third loss in the semi-final with BDTTA’s Paul Lim defeated by Lim Yi Heng 3-1 (11-9, 7-11, 6-11, 9,11). Brunei was also crowned champion of the Consolation Pool category last year. The tournament was joined by 16 teams from hosts Sabah, Brunei, China, and Thailand. The championship was organised by the Kota Kinabalu Table Tennis Association (KKTTA) and was initially called the Commercial Cup Championship. However, it was then changed due to the increased participation of foreign players. THE Brunei Darussalam Table Tennis Association (BDTTA) is hoping to produce a good performance in the Malaysia International Table Tennis Masters 2015 in Sabah on Sunday. The Sultanate will be sending three teams namely comprised to the two-day tournament that will take place at the Borneo Sports Arena in Kolombong, Kota Kinabalu. Speaking to The Brunei Times this week, BDTTA vice president Hj Said Sheikh Hj Yahya – who is also the team manager and one of the players – hope they can win a medal. “Alhamdulillah, I am really happy with our preparation so far as everyone is in good condition,” he said. “We have been training together for two weeks now, but most of us also have individual training for the past few months. “Hopefully we will be able to get into the semi-finals or final and get a medal from the competition,” he continued. The championship is organised by the Kota Kinabalu Table Tennis Association (KKTTA). Initially the competition was called the Commercial Cup championship but was changed due to a lot of foreign players featuring in the competition. Two categories set to be contested for the tournament - Premier Team and Novice Team. Premier is open to all international, national and state players while novice is open to local players that have never represented the state in any tournaments. BDTTA are no strangers to this competition as they have been joining it for the past few years and won silver in the novice category last year. The BDTTA Table Tennis Tournament for Youth Schemes concluded yesterday afternoon with the presentation of medals to the winners. Team JBS Scheme managed to dominate the tournament after winning in all 7 categories. In the final of the 15-year-old girls singles category, Fiona Hii Wee Ting from the JBS Scheme defeated her teammate, Leong Yi in straight sets with an 11-2, 11-3, 11-8, 11-5 victory. Meanwhile, Abd Wafi, also from the JBS Scheme won the Under-21 mens singles category after downing Ak Abd Hakeem Pg Hj Md Noor 4-3. Another player from the JBS Scheme, Ak Abd Rasheed Pg Hj Mohammad Noor emerged as the champion in the 15-year-old boys singles category after recording a 4-2 victory over Ak Abd Basheer Pg Hj Mohd Noor. Meanwhile, the pair of Ak Md Sufi Fakhrullah Pg Md Sufian and Ak Abd Rasheed Pg Hj Md Noor, both from the JBS Scheme defeated the pair of Ak Abd Basheer Pg Hj Md Noor and Md Khairuddin Omar with a score of 4-2. The medals were presented to the winners by Hj Damit Hj Abd Rahman, the President of the Brunei Darussalam Table Tennis Association. The two-day tournament was held in conjunction with the National Youth Day 2015. BANDAR SERI BEGAWAN, 14 Sept – Seramai 80 peserta berumur bawah 15 dan 21 tahun menyertai Kejohanan Pingpong Skim-Skim Belia anjuran Persatuan PingPong Brunei Darussalam (BDTTA) di Kompleks Sukan Menglait pada 11 September lalu. Kejohanan yang berlangsung sehingga 13 September itu disertai oleh Sekolah Chung Hwa Bandar Seri Begawan, Ikatan Persatuan Belia Bunut (IKERAB), Kolej Cosmopolitan Brunei, skim JBS, Universiti Brunei Darussalam (UBD), Institut Teknologi Brunei (ITB), Pusat Tingkatan Enam Meragang, Belia-Belia Kuala Belait dan Sekolah Menengah Katok Brunei. Hadir menyaksikan perlawanan ialah Presiden BDTTA, Haji Damit bin Haji Abd. Rahman yang turut menyampaikan hadiah kepada pemenang. Pertandingan akhir Regu Lelaki Bawah 15 Tahun Kejohanan Pingpong Skim-Skim Belia. THE Department of Youth and Sports (JBS) scheme’s players dominated the first round of the Brunei Darussalam Table Tennis Association (BDTTA) Youth Schemes Table Tennis Championship 2015 yesterday. JBS scheme produced a strong performance in the first round as all their players top the groups in all events contested at the Multipurpose Hall of Menglait Sports Complex in Gadong. Amongst the players from JBS Scheme is Ak Basheer Pg Hj Mohd Noor – who was the champion of Brunei National Junior Table Tennis Championship for male’s single Under-18 last May – put on a strong performance by winning all his four games in Group C of men’s single Under-21 category. He started his campaign by beating Goh Tech Wei from Chung Hwa Middle School 3-0. He continued his impressive start with another win over Dublin Tin Zhi Ming from Chung Hwa Middle School 3-2. He then completed his remarkable campaign by beating Hizbullah from JBS Scheme and Abd Wafi from the Universiti Brunei Darussalam (UBD). Meanwhile Fiona Hii Wee Ting from JBS Scheme – also the champion of Brunei National Junior Table Tennis Championship for girl’s single Under-18 –won all her games in Group B for the girl’s single Under-21 category. She opened the tournament with a convincing win over King Sii Sing with a set score of 3-0. The JBS’s player then overcame a tough challenge from See Tying Ni from Chung Hwa Middle School after she only managed a narrow 3-2 win. Fiona then topped the group with six points after she won her final game 3-0 over Naomi Yamandoe from UBD. “I am really happy with the achievement of the players as all of them progressed to the second round,” said the national table tennis coach Tjatur Budi Setiojono to The Brunei Times yesterday. “I also managed to identify few more young talents today,” he added. “A lot of them showed great talent and I’m sure with more proper training, they can be included in the national team in the future,” continued the coach. The competition will continue today with the second round in the morning, followed by finals for all categories. SEVENTY junior paddlers are vying for top honours at the Brunei Darussalam Table Tennis Association (BDTTA) Youth Schemes Table Tennis Championship 2015 which started yesterday. National table tennis coach Tjatur Budi Setiojono was pleased with the turnout at the competition he believes that more could have been done to attract people to join. “The way I see it, table tennis is not really a popular sport in Brunei, but we’ve got some good talent,” said Tjatur in an interview with The Brunei Times yesterday. “I hope to make the sport popular one day. “I am very happy we are organising this tournament because when I normally scout for new players, so I am thankful to the BDTTA and Department of Youth and Sports for that. “This is a very good opportunity for all the junior players to showcase their talent and earn their place in the national team… I hope all the players will go out there and give it their best,” added the Indonesian. Six categories are being com peted in the tournament; boys’ singles Under-21, girls’ singles Under-21, boys’ singles Under-15, girls’ singles Under-15, boys’ doubles Under-21 and girls’ doubles Under-21. The tournament aims to provide junior athletes early exposure to competitive matches and a chance to represent the country at future tournaments. Among the players competing at the tournament was Ak Abd Basheer Pg Hj Mohammad Noor, who competed at the 21st South East Asian Junior and Cadet Table Tennis Championship in Malaysia in June. “I really hope that he (Ak Abd Basheer) will be able to perform well and win…We are currently preparing for next year’s South East Asian Junior and Cadet Table Tennis Championships, so I am looking for a number of new players for the tournament too,” Tjatur said. All the first round matches at the BDTTA Youth Schemes Table Tennis Championship 2015 are conducted in round robin format and will be followed by knock-out stages. The finals for all six categories will be held tomorrow. BANDAR SERI BEGAWAN, 11 Sept – Seramai 20 peserta pemain Asas Junior / Senior Pingpong menghadiri Latihan Pengadil bertempat di Stadium Negara Hassanal Bolkiah. Laihan berkenaan dijalankan oleh Jeny Koh – BDTTA Pengadil Antarabangsa yang bertujuan melahirkan pelapis pengadil masa depan negara. Sementara itu mulai hari ini sehingga 13 September, BDTTA menganjurkan Belia Skim Kejohanan Pingpong Di Kompleks Sukan Mengelait. Lebih 100 peserta mengambil bahagian dalam kejohanan tersebut. Tujuan utama adalah untuk menggalakkan pemain junior menjadi lebih berpengetahuan dan berpengalaman dari segi teknik dan prosedur permainan. Sesi bergambar ramai peserta pemain Asas Junior Senior Pingpong menghadiri Latihan Pengadil. A SELECTION of national athletes have recently said that competing in more tournaments will help develop and raise the standard of their respective sports in Brunei. Speaking to The Brunei Times last week, four national athletes shared their views about the importance of organising local tournaments. National shuttler Jaspar Yu Woon Chai stated that local tournaments play an important role to improve sports, saying that such competitions play a vital part towards developing athletes and raising the competitive standard of the country. “Obviously, there will be that extra motivation and commitment in training,” he said. “There is a good amount of tournaments lately happening in Brunei and I would like it to continue. “A lot of private firms have expressed interest in organising badminton tournaments because it’s a popular sport and they seek collaboration with the National Badminton Association,” added Yu. National table tennis player Wee Tzu Min believes that more talent can be identified if there is an increase in tournaments organised. “When there are more tournaments, more talents can be scouted as it usually attracts more players,” he said. “For me, looking for more talent is very important - especially in youth as the earlier they are developed the more they can improve. “Furthermore it would encourage more commitment from the athletes to work harder in training since they have targets… It would create more motivation for players,” Wee noted. As for national runner Muhammad Amar Safwan Hj Zaidin, local competitions are important for junior athletes like him to monitor their improvement. The 15-year-old is currently training with the Department of Youth and Sports’ athletics scheme in Brunei-Muara under the guidance of national athletics coach, Isidro del Prado. He is considered to be one of the brightest young athletes according to his coach, and he is scheduled to compete in the 400m event at November’s ASEAN School Games which will be hosted in Brunei. “As an athlete, of course I would like to compete in more tournaments as I would be able to see my progress from time to time,” he pointed out. “It will also allow me to see at what level are my competitors at, so it will motivate me to train harder. “However there are only a few commonly being held here in a year. “I believe that by joining more competition, it will give us more experience which is also important for our progress,” said the 15-year-old who has set his sights on competing in the Olympics. As for London 2012 Olympian Maziah Mahusin, she was a bit upset at the lack of high-level tournament for elite athletes like herself. “For me, it’s a loss for athletes when there is lack of tournaments as it makes it difficult for us to know our progress,” she said. “We have been training hard almost every day but there are only one or two tournaments that we can look forward to in a year. “For now I am just preparing for the upcoming Brunei Athletics Open Championship which is scheduled for next month,” she said. THE national table tennis coach Tjautr Budisetiojono plans to hold a training camp for young athletes during school holidays. In an interview with The Brunei Times, Tjautr said: “I want to organise a training camp during the school holidays, may be for one to three weeks. It would be easy for me to focus on their training as they would be free from their studies. There are a lot of talented players here actually, but they just need more training and exposure to different competitions to get better,” he said. The coach also was pleased with the improvement made by his players recently. The national junior team competed in the 21st South East Asian Junior and Cadet Table Tennis Championship in Kuala Lumpur last month. “I am very happy with the progress made by my players. They have shown a great development in terms of their skills and techniques in the game. In the tournament, they managed to beat players from the Philippines and Laos. “In the previous tournament (held in Brunei in 2014), they failed to win a game in their group match, but now (in Kuala Lumpur) they have entered the quarter-finals,” said the coach. Despite the improvement, the coach stressed at the need for more training. “They will still need to work on their physical training, footwork, endurance and mental toughness. We will also need to have a lot of match practice. As they are still young, sometimes their performance is affected due to a lack of mental toughness. They tend to make wrong decisions during the game because of their failure to handle pressure,” said Tjautr. “I will be working on their weaknesses so that they can perform better next time,” he added. The coach also shared his delight with the development of table tennis in the country. “This sport may not be the most popular here, but I am very happy with the increase in the number of table tennis players in the country. A lot of younger players have joined the training scheme. “I hope this will continue and table tennis will be one of the major sports in the future,” said the Indonesian. WEE Tzu Min, after winning the Brunei National Table Tennis Championship recently, is now confident of clinching the President Cup Table Tennis Championship to be held in December. The number one ranked national player has won a lot of major tournaments in Brunei, including Sukan Kebangsaan Brunei Darussalam 2012, National Open Table Tennis Championship 2013 and the Brunei National Table Tennis Championship in 2015. Tzu Min previously represented the nation on few occasions including South East Asian Table Tennis Championship 2014 in Cambodia, Commercial Cub Sabah 2014, Asean University Games 2012 in Bangkok and Sukan Mahasiswa Borneo 2012, where he managed to bring home a bronze. During an interview with The Brunei Times yesterday, he was very pleased with his recent form and was keen to win the President Cup. It is the only major tournament that Tzu Min has failed to win so far in Brunei . “I am very happy to have won the National Open Table Tennis Championship as it has been my aim since I was still a junior,” he said. “Now I have already won two out of the three major table tennis championships usually held here. “I’m in a good run of form now and hopefully I can win the President Cup this December to complete my list. “It is going to be tough as there is a lot of strong competitors such as Pg Sofian Pg Ibrahim and Samuel Ravales, whom I consider to be my nemesis in table tennis,” added the champion. Sharing his experience, the 28 year-old said going for training was quite difficult early in his career. “During my junior years, I walked from my hostel at Maktab Duli for 20–25 minutes to the Menglait Sport Complex just for training almost every day. “My coach was very strict when it comes to training as he always pushed us to do better in training and punished us if we slack off. “But I know in the end, it was going to be worth it,” he said. Tzu Min also spoke highly of his coach at that time, Duan Yong Jun, who was from Singapore. He was previously a gold medalist at the 20th Southeast Asian (SEA) games and was ranked 75th in the world once. “I learnt a lot from him and was very lucky to get an opportunity to be trained by a coach with that kind of calibre. “After he moved to Canada, there was hardly any coach that can match the quality of him,” he said. Sharing how he started to get involved in table tennis, he said it was just for fun for him in the beginning. “My uncle brought me to play with other players at the Paiyuek Primary School when I was around 15-16, and it was just to fill up my time. “It was only after I got a third place in Pesta Sukan Remaja at the age of 17, I became serious. “I was selected to train with the national junior team by the coach at that time,” he explained. Since then he never looked back and became one of the best players in the nation. However, he stressed that training hard, good discipline, mental toughness and passion for the sport is vital to be successful. “To be successful in this sport, you have to be passionate about the game. “Also training and discipline is very important to maintain the performance of the players,” said the national athlete. While talking about his idol - Ryu Seung Min, South Korea’s national player - Tzu Min, said: “He’s my favourite because of his outstanding footwork, explosive forehand attacks and his persistence to win points. “Sometimes I try to model my game-play like him. “The favourite table tennis match I watched was when he beat a top-seeded player from the Chinese national team at the 2004 Summer Olympics,” he added. Speaking about his future career, Tzu Min, who currently is the committee member of Brunei Darussalam Table Tennis Association (BDTTA) and Achutan Spin Ping Pong Club (ASPPC), hoped to contribute in developing and raise the awareness of the sport in the country. “Currently I am slowly transitioning to be a coach, as I want to use my experience and knowledge to help the juniors. "The junior players now are a very good batch and I really want them to improve more in their game. They just need more exposure. “Hopefully one day, they will bring more medals to Brunei and table tennis will be one of the major sports in Brunei,” Tzu Min added. Great news and hope Brunei can increase their overall table tennis skill very soon and compete with world class players.